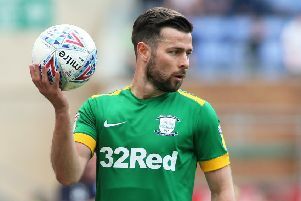 Preston North End’s start to the season has been a bit of a mixed bag and for that reason the timing of the international break has been good. You can debate all day long about these gaps in the fixture list and whether they benefit clubs or not. The simple fact is that if you are a five-game winning run for example, you don’t want to stop – the last thing you need is a fortnight’s gap. But when you’ve not quite clicked into gear like in North End’s case, a bit of time away is no bad thing. Last week, Alex Neil will have been able to give the players a couple of days off here and there, and still have time to get some work into them in between. Over the next few days he can concentrate on building up to the Reading game and those beyond it. It does seem to be about fine margins in many of North End’s games so far. They’ve not been getting battered in any shape or form and haven’t looked a million miles away. Mistakes they’ve made have been punished, that rub of the green has not gone their way. They’ve got through to the third round of the League Cup so they’ve shown they can win games – going to Leeds and winning 2-0 was a big result. When the action starts again after this break, it is a full-on schedule. I notice that is it a full Saturday/Tuesday schedule all the way through to the next break. Ask any player whether they would like the schedule to be like that or a Saturday to Saturday programme, and I know what most would say. You want the games to come thick and fast, players just want to play rather than have a long build-up on the training pitch all week. Managers probably see it differently, wanting to have plenty of time on the training ground to work on shape and tactics. When I was playing, it was all about the matches. You’d be happy to play on a Saturday, come in Sunday for some recovery, then on Monday do a light tactical session ready for the next game on Tuesday. Wednesday would be a day off then it was back in on a Thursday to start working towards Saturday. Then you press repeat for the following week and the week after that. If you were in a run of form and playing well, you didn’t want a break. The fixtures are tough ones for North End over the next few weeks but that is only to be expected in this division. After Reading, it is Leeds and Sheffield United away. There’s the League Cup game against Middlesbrough and then West Bromwich come to Deepdale. After that it’s Aston Villa away and Wigan at home, then comes the international break in October. I think after that little lot, there will be a clearer picture of how the league is shaping. Hopefully North End can get these suspensions out of the way, patch one or two players up, and get back to what they were doing last season – something which served them well.